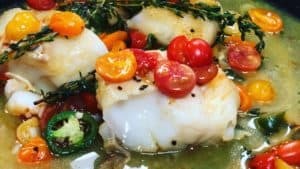 Want to make a fabulous appetizer or dinner in just about 12 minutes, then this recipe is just for you! 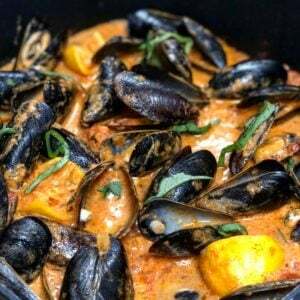 Mussels Marinara is super simple, quick and elegant. If you are local to Charlotte, head on over to The Carolina Meat & Fish Co. and grab the fresh marinara and loads of PEI mussels! Begin by rinsing the mussels under cold water. Discard any opened mussels. In a pan, add the olive oil, marinara, chopped garlic, chopped shallots, a few dashes of salt/pepper, and the red pepper flakes. Allow to cook on medium for just about 2 minutes. Squeeze in the juice from the lemon wedges and toss the wedges into the sauce. Add the clam juice. Turn up the heat and allow to almost boil. Add the mussels. Place lid on pan and allow the mussels to open (this should take only about a minute or so). Be sure not to overcook the mussels. As soon as they open, they are done…remove from heat immediately. Top with the basil and if you so desire…which I do…add the heavy whipping cream. Stir and serve with a ton of crusty bread as an appetizer or serve on top of linguine as a meal! Want to see the full video? Click here! 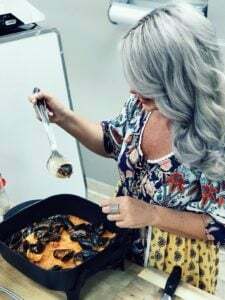 Check out our Facebook pages to see what we are cooking up live each week Charlotte Fashion Plate Carolina Meat & Fish Co.